European space scientists have made the world's fastest and most sensitive astronomical camera, for use in their massive ground-based VLT (Very Large Telescope). The snappily-named OCam doesn't have the most impressive resolution - shooting images just 240 x 240 pixels (1/20th MP) in size. But it more than makes up for it in speed (shooting 1500 images a second), and especially sensitivity, able to make out planets orbiting neighbouring stars. 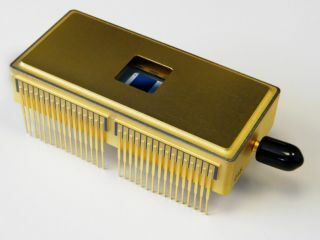 "This breakthrough camera is without an equivalent anywhere in the world," says Norbert Hubin, head of the Adaptive Optics for ESO space agency. "The camera will enable great leaps forward in many areas of the study of the universe." Telescopes on the ground usually suffer from the blurring effect induced by atmospheric turbulence. Adaptive optics techniques overcome this major drawback, so that ground-based telescopes can produce images that are as sharp as if taken from space. Adaptive optics is based on real-time corrections computed from images obtained by a special camera working at very high speeds. "The quality of the adaptive optics correction depends on the speed of the camera and on its sensitivity," says project coordinator Philippe Feautrier. "But in general the faster a camera is, the less sensitive it is." This is why cameras normally used for very high frame-rate movies require extremely powerful illumination - not an option for astronomical cameras. The British made OCam solves this dilemma by being not only the fastest available but also very sensitive, suffering around ten times less digital noise than the detectors currently used on the VLT.